Rocksteady XS 1.5 bluetooth portable speaker with Speakerphone. Question: What has the exact dimensions of the Rocksteady XS portable bluetooth stereo speaker but with even more cool features? Answer: The Rocksteady XS 1.5 with Speakerphone. My kids, who are all on summertime vampire slumber hours, all three hit my office door at the same time to find out what the heck was going on. When I showed them the new XS and the fact that I could receive phone calls on it, they all responded, “Cool.” They also looked as if I had just run over their iPhones in the process. (They obviously wanted me to tell them it was for one or more of them) I waved them away while I continued my play–, ahem, research with the new XS. She returned it to me albeit reluctantly. I also told her that the new XS isn’t exclusive to my phone or a single device anymore. You can bluetooth connect two devices simultaneously and, like my Nissan Cube, the new XS remembers the last four devices paired to it for easy connection later. And one notable feature that they forgot to tell me about in the literature: Killer sound. Of course I understand that marketing people don’t use phrases like “freakin’ killer” or “blow you away” but wow, just wow. You have to hear it to believe it. OK, what they did say about the sound quality is this: Proprietary air channels inside to augment the sound range and volume using patent pending air channeling and membrane technology. Uh, yeah, that’s what I meant by “blow you away” quality. I just didn’t get all geeky with it. The sound grabs you by the throat and pounds your head. That’s a better way of saying it. And it’s not just the volume, which is important but the clarity and quality of the sound is unreal. I’m glad I don’t understand the magic behind it because I like it. I’m no sound expert but the tone is excellent and I never got any distortion even at the highest setting. The sheer volume and clarity on this little device is one that could quite possibly drive your neighbors crazy–and if you knew my neighbors, you’d know that’s a pretty short drive. For the highest setting, I turned my phone’s volume all the way up and then tapped the XS volume + button several times to get the most from it. Remember the days when party DJs used to bring all that crap with them? Well, frankly, unless you have a huge auditorium, you could start your own DJ business with a phone and two or three of these new XSs. The XS would be really cool for street musicians too who don’t want to lug around a bunch of sound equipment. If I were a street musician, I’d use two of them and I’d have all the attention–even in Las Vegas, where you’ll have street performer overload after a stroll on the strip. I compared the sound on this little device to my expensive HD TV and there’s no comparison. (I’m going to figure out a way to play my TV through it and give you an update). The whole point of any sound device is to give you a great listening experience. The Rocksteady XS with Speakerphone will do just that. You’ll be impressed. But its other features make it a “must have” pairing with your phone or other bluetooth-capable audio devices. A note about the speakerphone feature. The microphone is located near the Pause/Stop button on the top of the XS. Apparently it’s pretty sensitive because my wife who answered my phone with it was standing about six or more feet away after she pressed the Pause/Stop/Answer/Hangup button. We could both hear each other just fine through it. I think the capability to receive calls through the XS is my personal favorite feature. Well, other than the incredible sound quality, it’s my favorite feature. 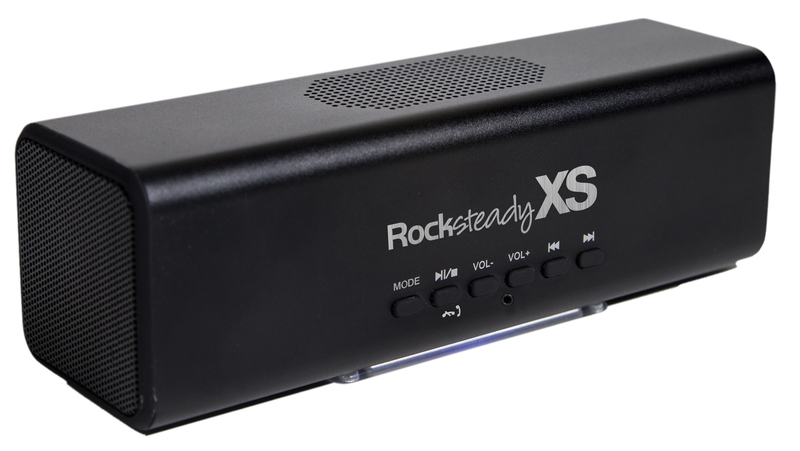 The Rocksteady XS 1.5 with Speakerphone is a great value. It is a stand-out in its class and you’ll be happy with it. As of this writing, Amazon.com is out of stock on it, so that should tell you something. It tells me that you’ll be lucky to find one and you should grab it when you do. In the, “Why is it Frugal?” category, the Rocksteady XS 1.5 with Speakerphone is frugal because it does everything you want it to. In other words, it is the single best device to pair with your phone that I’ve seen in a while. It is more than just a portable speaker, it’s a companion. It’s what you need and its features make it a bargain.